Every year, people set goals such as losing weight, decreasing their spending, increasing their earnings, or to just be an all-around better person. While over 40% of the population sets goals for the new year, only 8% of those who set goals actually achieve them. This is a fairly dismal percentage. Instead of setting lofty goals that are doomed for failure, why not set smaller goals that could make a real difference on your future investments? Asset allocation might sound like a complex term, but it’s not. Asset allocation simply describes what portion of your money is invested in various asset classes. If 70% of the funds are in stocks and 30% are in bonds, then your asset allocation is 70:30, stocks to bonds. By owning stock, one actually owns a portion of a company (which is why it is often referred to as an equity). By owning a bond, an individual is actually a lender to a company and typically receives interest on the principle. Between these two types of allocations, stocks are often considered to be higher risk than bonds because of the larger volatility in the market. Higher risk can lead to greater returns, which is why a common approach investors utilize is to consider a higher weighting in equities versus bonds early in your career, and increase the weighting in bonds as you approach retirement, depending on your personal risk tolerance. 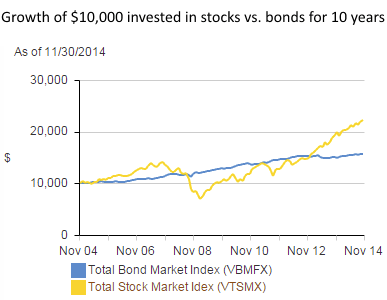 Within the past 10 years, growth in the stock market has surpassed the bond market as seen in the chart below. The bond market as a whole has shown stability during upswings in the stock market, and has shown relative growth during the down stock markets. In total, the stock market has certainly been more volatile in the past 10 years, but has also been more profitable. There are many different asset allocation models you can consider to see which might be right for you. Once of the simplest is the old rule of thumb, which is calculated with simple subtraction. Individuals would subtract their age from 100, to quickly discover what percent of their portfolio should be comprised of stocks. The remaining percent would therefore be made up on bonds. As an example, a 30 year old investor could use this guide to invest 70% of his/her portfolio in stocks and 30% in bonds. This traditional rule of thumb is just a guide for the average investor that would like to decrease the risk of their investment portfolio losing value as they grow older. While it does make sense that one would like to be more protective of their money as they age, is this traditional rule of thumb still valid today? Some argue that it is outdated because of one simple factor: people are living longer. With an increased average lifespan, many retirees are realizing that their money might not last. Due to this realization, some have adjusted their rule of thumb model to subtract their age from 120 instead of 100 to shift their asset allocation from stocks into bonds more slowly. This adjustment keeps investors more heavily into stocks for 20 years longer than the traditional rule of thumb. This updated rule of thumb can increase the chance of a larger retirement fund but it can also increases risk. While both the old and new rule of thumb can be helpful in deciding your asset allocation goals by age, they do not apply to everyone. Some individuals may still be working at age 70 because they have a need to increase their retirement fund. Because of this need, they might also consider it in their best interest to allocate a greater portion of their investments to the stock market. Others, however, might have already accumulated a very large nest egg by age 40 and may wish to protect it from the volatility of the stock market. For them, a reduced allocation in the stock market might be better suited to their desire for lower risk. There are other factors that could influence asset allocation as well. Besides age and the size of your retirement portfolio, your ability to withstand risk plays a large role. There are some that simply can’t sleep at night if their investments are at risk. Due to their discomfort with market fluctuations, risk averse individuals may choose to invest heavily in bonds and other more secure investments, and might avoid stocks entirely. Having a goal to adjust the allocation of your investments as you age is often encouraged, and is one method that can help reduce surprises to your retirement account and help you prepare for the future. After deciding what allocation percent is best for you, maintaining that allocation by rebalancing is incredibly important. With constant market fluctuations, keep in mind that rebalancing is typically required to maintain your desired allocation ratio. Some asset allocation products require investors to choose from predefined models that are unchangeable, which often include overlapped asset classes. Motif Investing, however, offers customizable Horizon asset allocation models, which are aimed to provide an enhanced, low-cost, and diversified solution. There are currently nine Horizon models amongst 17 asset allocation motifs available. You can trade any of the nine professionally-built Horizon motifs commission-free or customize them to your needs and pay just $9.95 total commission. Horizon motifs provide investors with a starting point to consider in allocating assets within their larger portfolio. However, Horizon motifs should not be considered a recommended strategy or comprehensive solution to your overall investing needs. There are many considerations when structuring your portfolio, such as cash needs, family-planning needs, tax and estate planning strategies. Motif does not provide any investment, tax, or legal advice and suggest you contact your own investment, tax, or legal advisor for further information your investment strategy. $0.00 commission for trades (buys, sells, following rebalances) for the benchmark versions of the nine Motif-created Asset Allocation Horizon motifs. Commissions for any Horizon motifs that are customized in any way – adjust weighting, add or remove securities, choose not to follow a rebalance event, will include a $9.95 total commission per motif transaction or pay $4.95 per stock for individual stock/ETF transactions.